NEW BEDFORD — On the eve of the presidential election, parishioners at Grace Episcopal Church say they believe the United States has lost its way because of its lack of civility in the campaign. About two dozen parishioners met in silent prayer for about an hour Monday night in the historic church at the corner of School and County streets, hoping for healing, reconciliation and acceptance regardless of whether Hillary Clinton or Donald Trump is elected president. “There has been a constant, oversaturation of these messages,” the Rev. Christopher R. Morck, the church’s rector, said of the candidates’ campaign themes, noting they have become amplified in the final days. “It almost feels like a non-stop assault to the point where you don’t know if you want your children to watch it. “We’re not advocating for candidates. We’re advocating for reconciliation and healing, regardless of the outcome of the election,” he said. Rev. Andrea Wyatt, assistant rector, said the service was held to pray for the country’s elected officials as well as for an end to the divisions that have marked this campaign and the peaceful transition of power after either Clinton or Trump is elected. 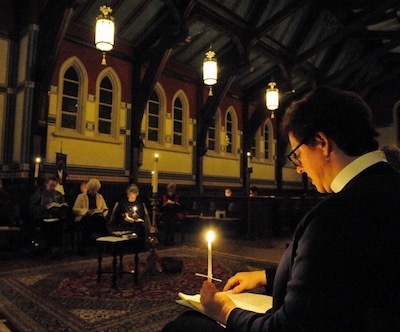 Following the lead of the three Episcopal bishops of Massachusetts, who called for a 48-hour vigil sometime between noon on Sunday and noon on Election Day, Grace Church scheduled an hour of silent prayer from 6 to 7 Monday night, where parishioners could reflect and pray anyway they wished. Several parishioners, in personal interviews with The Standard-Times, said the division that has reared its head in this election is similar to what they have read or seen in the period leading up to the Civil War. Howcroft said he will support whomever is elected, but will continue to speak out when he sees inequities. “The fight for social justice with me never ends,” he said. “It’s what Mr. Trump is selling. Our nation and our country is hurting,” she said. Zelinda Douhan of Dartmouth said she always finds comfort in her church. “I am here for a sense of peace and serentity and quiet and a time to reflect on God in his role in all of our lives,” she said. Morck said his hope is that the service gave parishioners some sense of unity. “God’s purpose is being worked out even through the most difficult circumstances and we are part of that,” he said.